It seems like magic: the ability to takeIndividual instance of a shot; a take = each time the camera is started and stopped. photographs on an object or space in real life and convert it into a 3D object or space in virtual reality. For non-fiction immersive storytellers, photogrammetryThe use of photography to survey and map a location from a variety of angles. seems like a dream solution to accurately translate the real world into the virtual world, without having to be or hire a 3D artist. The Guardian’s 6×9, in which an artist re-created a prison cell based on photos from an actual cell. No matter how great, it is an artist’s interpretation of an actual environment. The FRONTLINE/Emblematic’s After Solitary, in which the prison cell is created by using photogrammetry… not an artist’s interpretation, but the actual cell recreated through the photos. But how easy is this magic? And is it reliable to use now? 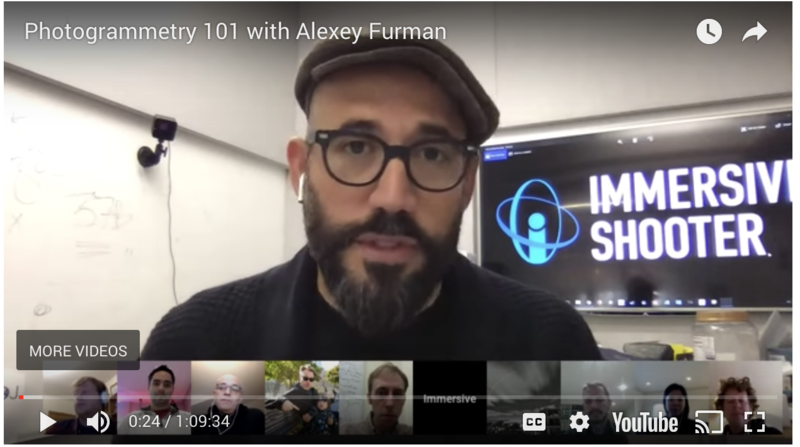 Inspired by the Unity Photogrammetry Workflow eBook, Immersive Shooter’s Editor at Large, Robert Hernandez, hosted a Google Hangout+ with Alexey Furman, a Ukrainian freelance photojournalist and co-founder of New Cave Media, who was awarded a Journalism 360 grant to produce a photogrammetry-based journalism story. In the discussion, they explored the opportunities and realistic challenges this new technology brings and how one could start. Also attending the Hangout were some of the journalism industry’s pioneers from all over the world, learning but also sharing lessons they’ve learned while producing photogrammetry-based stories. They included: Dan Archer, Carole Chainon, Nathan Griffiths, Ben Kreimer, Socrates Lozano, Matthew MacVey, Daniel Rojas Roa and Kai Rüsberg. Alexey Furman is a Ukrainian freelance photojournalist, Missouri School of Journalism alumni and co-founder of New Cave Media, a 360°/VR production company based in Kyiv, Ukraine. As a photojournalist, he covered the Euromaidan revolution, the annexation of the Crimean peninsula and the war in East Ukraine in 2014 for various national and international media outlets, and received multiple awards for his work, including POYi, NPPA’s BOP and Bayeux-Calvados Award for War Correspondents (France). He got interested in immersive storytelling in 2015 when studying at Missouri School of Journalism under a Fulbright scholarship. He co-founded New Cave Media in the summer of 2016. The company was the first to utilize 360° video for journalistic storytelling in Ukraine. New Cave Media’s first virtual reality project, Aftermath VR, got the Journalism 360 Challenge Grant in July 2017.